Today I wanted to share another great New England maker, Mariner Lines. If you're a dog-lover and a New England lover you need to have one of these beautiful hand-made nautical leashes in your life. Love the bait bag packaging! When I first stumbled across Mariner Lines, I thought their leashes looked beautiful and rugged and loved that they were made in Maine. But once I learned the story behind the brand I loved it even more as Mariner Lines was started by Stacia and her fisherman husband when their yellow lab Mariner became ill. Sales of these handmade leashes not only help them with medication expenses for their beloved pup (who is thankfully doing better), but a portion of sales is also donated to local rescue groups too. You can feel good about buying and using this leash knowing the good it does. 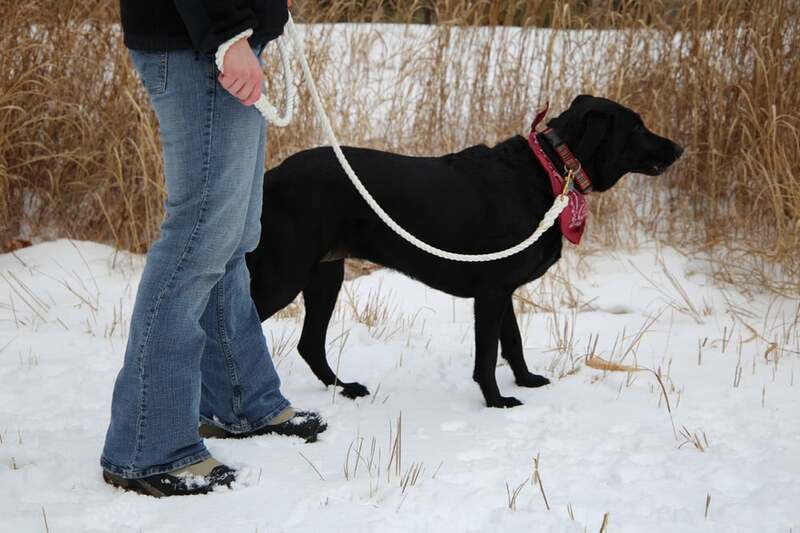 This weekend we brought our black lab Harley out for a short hike in the woods with our new Mariner Lines leash. Harley LOVES walking in the woods and was super-excited to put her new leash to the test. You see, the second you clip a leash to Harley's collar she pulls like a competition draft horse at the Fryeburg Fair... we've worked with her a bunch and done obedience classes but none of that matters for the first 10 minutes of the walk until she gets the excitement out of her system. Our Mariner Lines leash held strong and I felt confident walking Harley on it. One of my favorite aspects of the leash was the roundness of the rope in my hands. All of our other leashes are traditional flat nylon that dig into your palms when the dog pulls; I was pleasantly surprised to see that the thick round rope did not dig into my hands at all as Harley got the initial excitement out of her system. The leashes are hand-spliced together using rigging line and heavy-duty brass clasps so you know they're made to last. They come in many colors and there are even hand-knitted neck warmers for your pup and cowls for you available so you can coordinate. All the leashes are "one fathom" (about six feet) long - I just love how they incorporate the nautical theme into every aspect of their brand! Overall, I really love our Mariner Lines leash - it's rugged, durable, beautiful, and stands for helping pups in need. What's not to love?